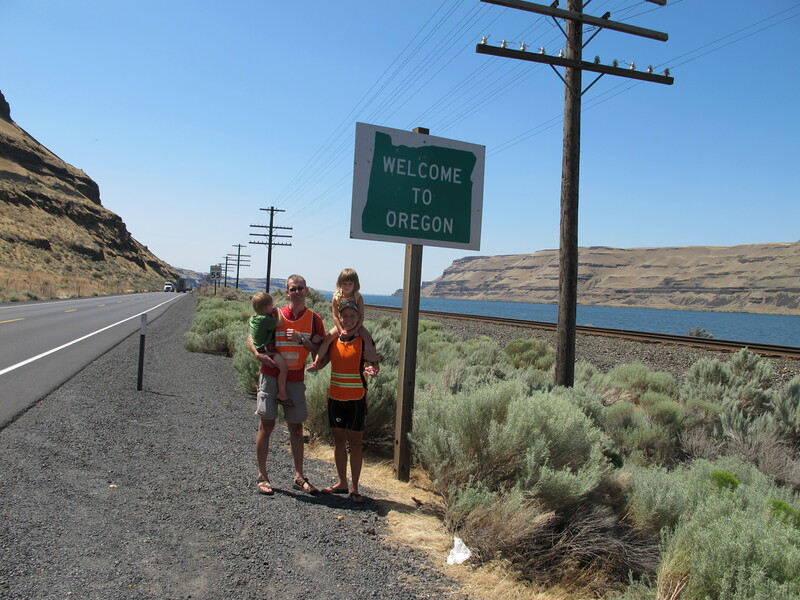 Bob drove us past a precarious place where the gorge started and the road hung over the river with little shoulder. 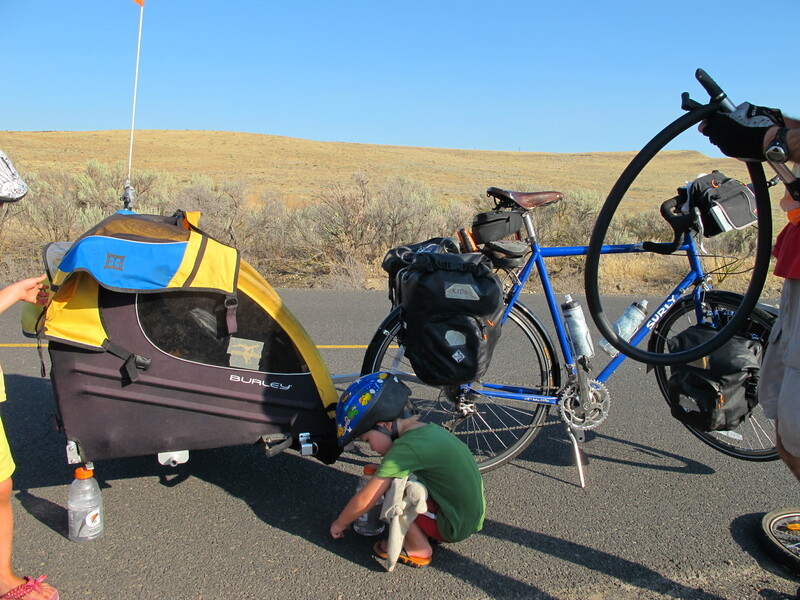 We purchased supplies and started our pedaling in an area known as the “Scablands” in the Horse Heaven Hills. The land there is barren and scarred from the great Spokane Flood that occurred between 18,000 and 20,000 years ago when the ice dam holding back Glacial Lake Missoula broke. 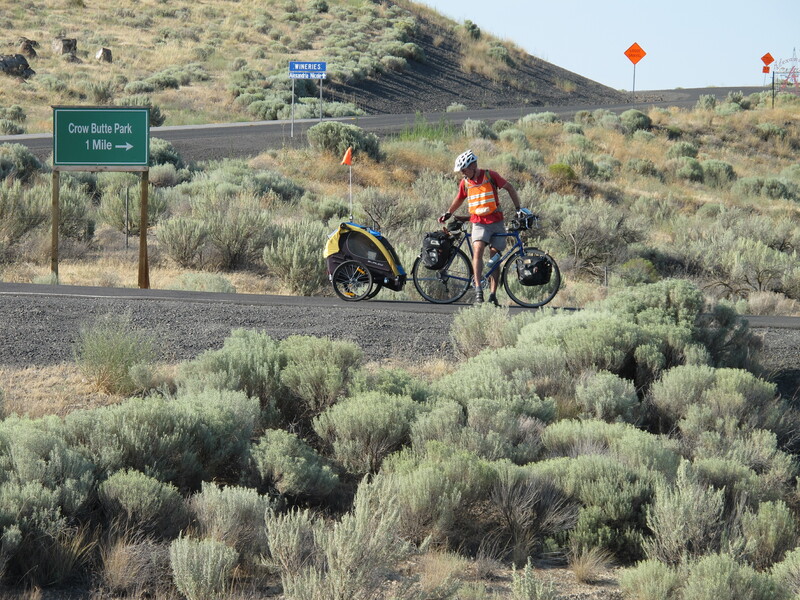 Our Adventure Cycling map says that evidence of the flood remains from Missoula, where the ancient shoreline of the glacial lake can still be seen on Mount Sentinel, which looms over the University of Montana, all the way to the Pacific. The air in the gorge smelled like rosemary and there were rattlesnake warnings everywhere. The desert scrub landscape contrasted with the tall electric line towers and it was black-asphalt-on-unexpected-desert hot. Not far from where Bob dropped us off we came to the Paterson Onion distribution plant, which was watering its lawn. 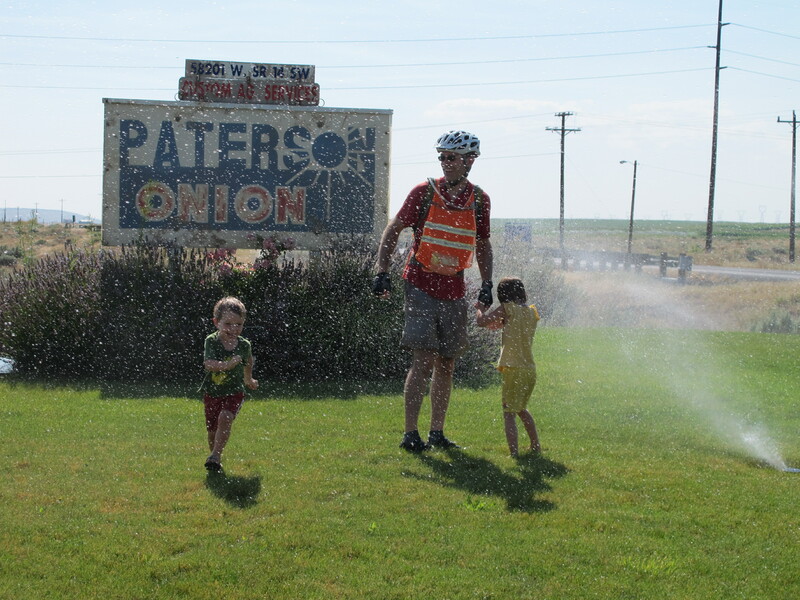 We hopped off our bikes for a frolic in the sprinklers just as an employee was turning them off! He saw our disappointment as he walked back from the pump house to his truck and literally ran to turn them back on. We played. Brady had an excellent potty experience (for those of you keeping track of that sort of thing). 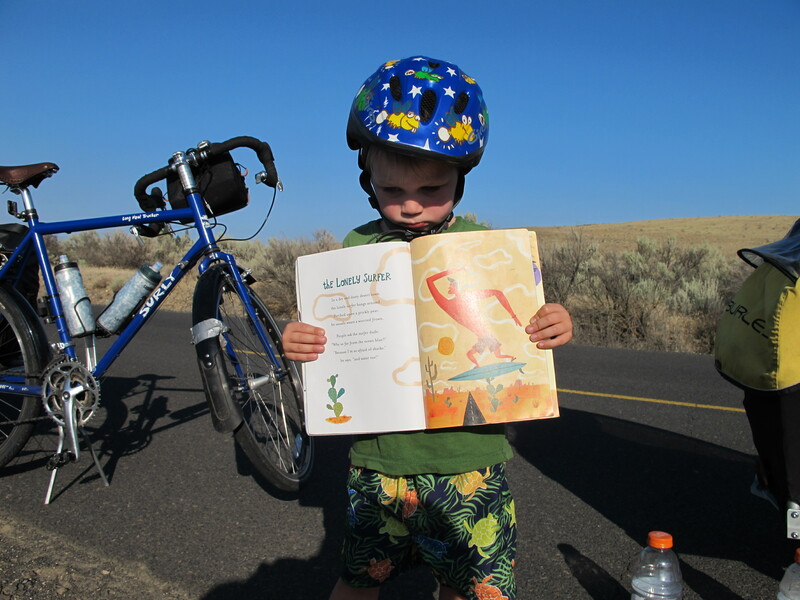 We rode to Crow Butte campsite and Jane kept repeating the first line from a poem we read aloud from a book Aunt Stephanie gave the kids in Lawrence, KS. 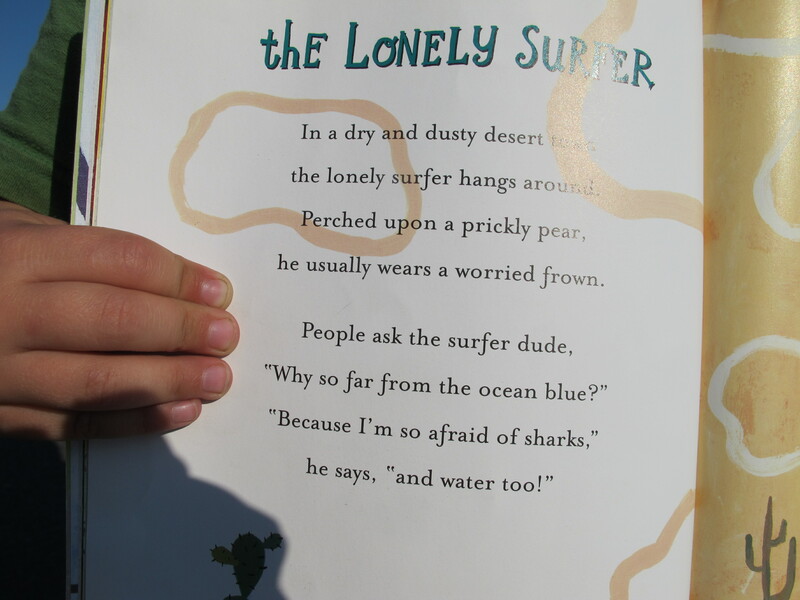 It’s called “The Lonely Surfer” in which the author explores the relationship between sense of place and personal identity, and makes children laugh. 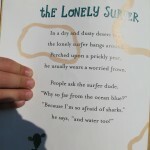 When we stopped to fix a flat a mile away from the campsite the kids wanted to read the poem and take pictures of each other with the lonely surfer dude. 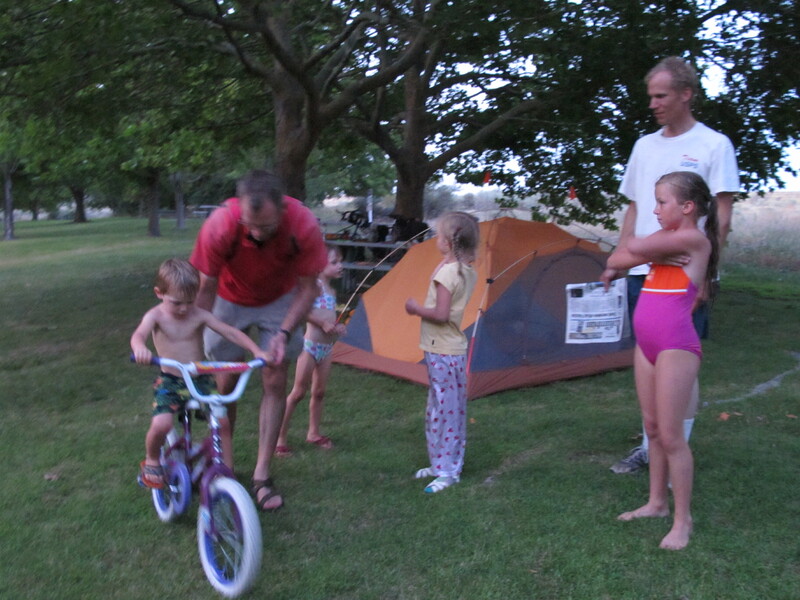 At the campsite we swam in the river, made stir-fry for dinner, met a family with ten children who gave us sturgeon to eat and let the kids ride their bikes. 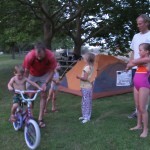 This entry was posted on Sunday, August 15th, 2010 at 11:24 amand is filed under . You can follow any responses to this entry through the RSS 2.0 feed. You can leave a response, or trackback from your own site.